Miaco set of three popular clipper blades sizes. (OS-BLA5-4F, OS-BLA5-5 & OS-BLA5-7) Clipper blade size 5 Skiptooth. Cuts 1/4"/6.3mm. Size 7 skip tooth. Cuts 1/8"/3.2mm. Size 4F. Cuts 3/8"/9.5mm. Replaces Oster clipper blade 919-06. Durable HRC60 High carbon steel. 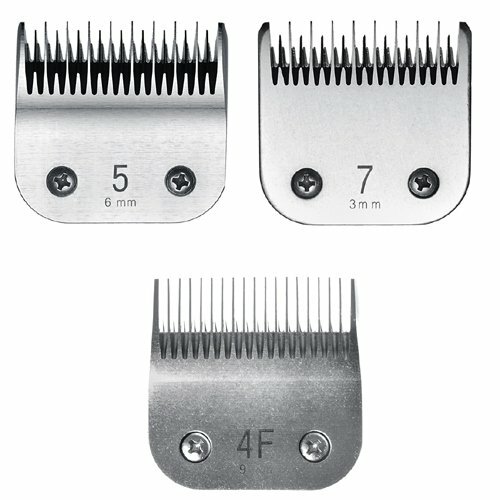 Fits all clippers that use A5 style detachable blades such as Oster A5, Golden A5, Turbo A5, Oster Power Pro, Andis AGC, Andis AGR, Wahl, Laube, Moser, Thrive, etc.